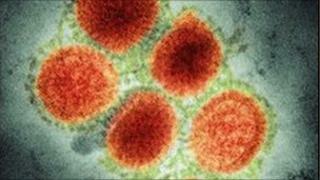 A third man has died after contracting swine flu in Greater Manchester, it has been confirmed. The patient died at Rochdale Infirmary. He had other long-term illnesses but swine flu was part of the cause of his death, the primary care trust said. On Tuesday, it was confirmed that two men had died at the Royal Oldham Hospital. They also had underlying health problems. All of the deaths occurred in the past month, the health trusts confirmed. People in vulnerable groups have been advised to have the flu jab. They include those aged over 65, those with a long term condition, carers, and pregnant women. Latest statistics show that only 28% of patients in north-west England with underlying health conditions have received the jab. Dr Jane Rossini, director of public health for Rochdale, said: "It is with regret that NHS Heywood, Middleton and Rochdale confirms that one person from the Rochdale borough has died at the Rochdale Infirmary, with swine flu as a part of the cause of death. He had other long-term health issues. "I am saddened by this event here in the borough." She added: "Can I urge people to take care of themselves - if you're eligible for a flu jab please make sure you have one." Two women from Merseyside, aged 29 and 32, have died in recent days, after contracting swine flu.